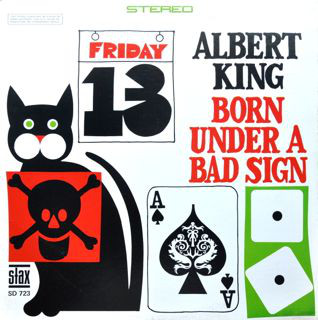 This is an excellent collection of the superb single recordings Albert King laid down on the Stax label, utilising the instrumental talents of Stax house band Booker T. & The MGs. It was eventually released as King's first album for Stax. It is a magnificent merging of King's searing blues guitar work and the MGs' Southern funk/soul organ sound. It is now revered as one of the greatest electric blues albums ever released. As most of the cuts were released as singles, they all have an upfront appeal to them. 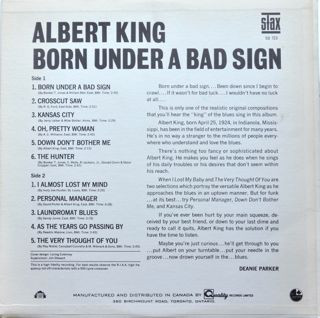 Highlights are the storming, brooding blues of the title track; my own personal favourite in "Crosscut Saw"; the insistent, bassy grind of "Oh, Pretty Woman" (not the Roy Orbison song, by the way); the horn-driven "Down Don't Bother Me"; the marvellous, chugging blues of "Laundromat Blues" and "The Hunter" (covered by both Free and Canned Heat in the early seventies. Check out the big, rumbling bass on "Personal Manager" and the guitar too, for that matter. Great stuff. The "unreconstructed" lyrics bring a smile to my face too. This is an outstanding album that is so representative of its genre. Highly recommended if you want to dip into some stonking late sixties electric blues. The sound is a full, warm stereo and very impressive considering from whence it dates. However, "Born Under A Bad Sign", "Crosscut Saw", "Laundromat Blues" and "Oh, Pretty Woman" can be found wonderfully re-mastered on the "Stax - the Complete Singles" box sets.